Everybody likes eye candy. Show us the most recent addition to your coin collection! It was particularly difficult to get, wasn't it? Doesn't anyone else get new coins? Anywhere, here is a Panda that was a challenge to find, for me at least. The fun in collecting isn't necessarily to own the most expensive coin (although that's nice too!) but to locate the scarce ones. Stats: 10 Yuan 1 oz. silver Panda, Mintage 20,000, 20th Anniversary and Listing Of China CITIC Bank. This coin is cool because the GOLD is dirty! No lie, check it out - Anything not yellow is not gold. Sometimes you get copper spots, and sometimes you get chunks of silver, steel, lead, ham and eggs, etc in your precious gold coins. Sorry it's a bit fuzzy, I need to get a better camera. You can see the gray color just fine though. For me, the impurities create an effect that resembles snow falling around the tiger. What a beautiful coin and design. Yeah, it is gorgeous. I have never seen a gold coin - or any coin - with solid impurities in it. The closest thing to it I've seen are fairly common "lamination" errors, where a layer of dirt gets rolled into the metal, and later the layer prevents bonding of the metal on both sides, so they separate and peel away like lamination on a piece of paper. We all know about copper spots and things like that, but those are very diffuse, blended, impurities that you can't see until they start to develop a patina. In this case, these are solid chunks of something. They look to me like iron filings, but I suppose they could be almost anything. They're not struck into the coin, like a "lint mark" would be, because they have a raised burr around them. The burr looks strange though, and I really think that a very thin layer of gold that was on top of the non-gold inclusion was lifted away from the coin in the same style as a lamination error while the die retracted. That exposed the impurity, and left a slight burr to confuse people who haven't seen it before. 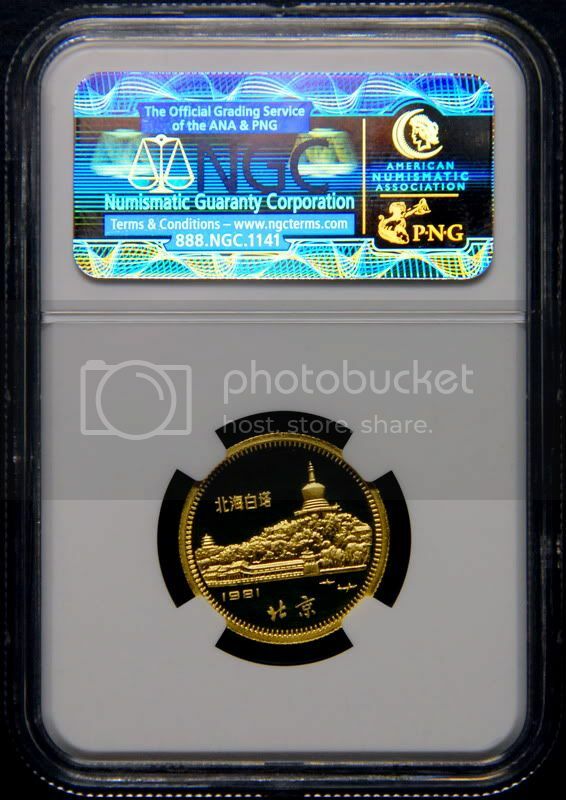 This coin grades PF70, so the NGC graders must have seen this before, and correctly granted a high grade. I have a metalworking background, so with some thought, I was able to figure out what these tiny grey spots were. Lint marks never have a burr, because the pressure of the die keeps them down. All very fascinating. That coin seems very difficult to find. I have one on the way from China. Funny thing is that NGC didn't even have it in the appropriate registry set. Last time I looked only two had been graded. They told me they would be adding it to the registry soon. I can't make sense out of what makes one commemorative Panda more difficult to find than another. The mintage is certainly no indication. I get the impression that the most action is going on in the "new" coin market. With over 3000 years of history, the Chinese people may not be as fascinated with old stuff like we Westerners are. I suppose it's an extreme version of the same phenomenon we see with ancient coins in Europe versus America. American are unfamiliar with them, and expect them to be museum pieces, whereas Europeans dig them up on a daily basis. Chinese people seem to see greatness in their present and future, rather than their past, which I suppose makes sense considering where China stands now in comparison to their recent past. 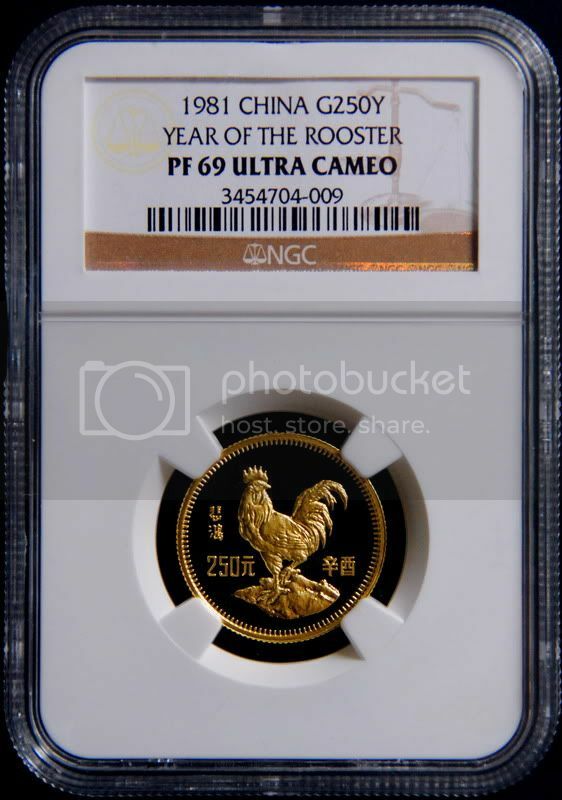 It seems the average Chinese coin buyer does not want a memento from 1985 so much as one from 2011! It seems like these are either extraordinarily tightly held, there are bags of them still resting in a vault somewhere, or only a fraction of the authorized mintage was actually struck. The story I heard is that most of the coins were distrbuted to bank employees which would make them "tightly held" I guess. The average employee might just throw them in a drawer and forget about them. I assume there is some loyalty to the company too and dumping a company gift on the secondary market might be frowned upon. I heard that, too. However it's been three years since issuance and the coins are worth quite a bit of money â€” a month of wages for many probably. It seems improbable that only a couple of dozen employees, or ex-employees, out of 20,000 would have converted these into cash by now. It also is a bit peculiar that CITIC employees are so much more retentive of their gifts than employees at other banks that have had Pandas minted for them. I agree with all those thoughts. That's what makes collecting these "event commemoratives" that much more interesting. I have a feeling some with high values today now will settle down eventually. I hate paying what I did for that coin but since I'm in it for collecting, I don't mind if a pay a little too much for a couple coins that complete my collection. The other thing about the CITC coin is that only two have been graded and they both recieved grades lower than 68 which is unusual for recent pandas. Does that mean that the bank employees who sell them play with them a bit first? Are you planning to get yours graded peter? Nice, a 2010! Congratulations, that's a rarity. I see this is your first post, welcome to the forum! What a nice way to start! Yeah haha, there are only a handful in the US too! Thanks! Yeah, that's true. Since I bought this coin, the approx. value has gone to $7600. Sounds like you made a good investment. What did it cost you? Probably but there's no time frame for doing it (grading). The coin I have is in excellent condition but the design has very shallow relief so the coin looks a little flat. The fields are highly polished, though, so it's a glittery thing in spite of the strange quality of the design or strike. Does yours have the box and COA? I almost bought another one that came with those but the seller reneged and returned my payment. He claimed he was robbed, but I suspect he discovered that his price was too low. It cost me around $4800 3 weeks ago. I made some more photos of this coin that look a lot better. I put my camera on a tripod and it makes much better photos now! You can see the gray impurities much more clearly. They look like a shred of steel flung off from a grinder. I know because I once had a piece like that lodged in my eye in an industrial accident (I fully recovered in about a week). The bits are usually elongated and look "torn" at one end, and pointed at the other...or it could be a piece of moon rock for all I know. I also took some pictures of the one post-minting blemish I could find. It's on the burr at the rim, but it's not deep enough to extend beyond the burr into the coin-proper. I suspect that might be why the coin was granted a PF 70 designation by NGC, despite what looks like a nick on the rim. The mark is so small that you can only see it with your own eyes if you can get light to reflect off of it. Otherwise, it just blends in with all the usual irregularities of the rim burr. I am SO SURPRISED at how good of macro photos my cheap Canon SD940 can make. I can see this rim ding in the photos even better than I can see it with any of my 5X, 10X, or even 20X loupes. It's pretty clear in the photos. The camera resolution is almost exactly the same as the view through my 20X loupe, but vastly better in quality. Next time I want a good view of a detail on a coin, I'm just going to take a photo of it instead of fussing with the finicky high power loupe. See also my postings about loupes for coins, and cameras for coin photos. "Does yours have the box and COA?" It should. I guess I'll find out when I open my box from China. Shipping these five coins off to NCS and NGC on Monday. Wow, what an impressive collection - and these are just your "new" coins. WOW! 5oz silver medals,1988 Hong Kong 7th International Exhibition and 1989 Guan Yin Goddess. 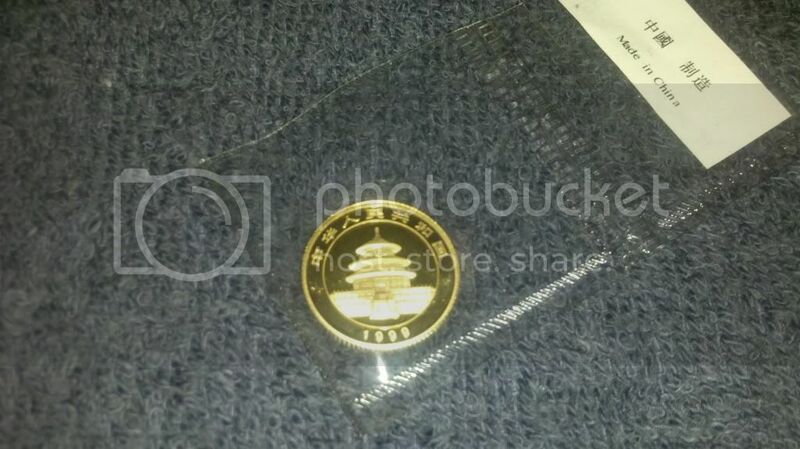 5oz silver coin, Y#108 1986 the 120th Aniversary-Birth of Sun Yat-Sen. I've never liked colored coins, but those ones are impressive. How are they colored? Is it something that won't fade or rub off over time? Nice photos. I normally don't like colored coins, but these look great. Are they enamel, or something durable like that? The early colored coins looked like a printer of some sort, and they were horribly ugly. Kind of like looking into the eyes of someone with fake colored contacts - they just creep you out. Colored coins were my least favorite until the Chinese opera coins and the Outlaws of the Marsh series came out. The color is screen printed or pad printed looking at them thru a magnifier it has the look of being enameled. They did a very good job. It sounds like you pay dearly for the privilege! I'm satisfied with them in a safe and secure NGC holder. Then I can let anybody look at them without much worry of damage. Hello, I'm new here but i have been a silent reader for a while now and i think this forum is great with full of information from the experts. 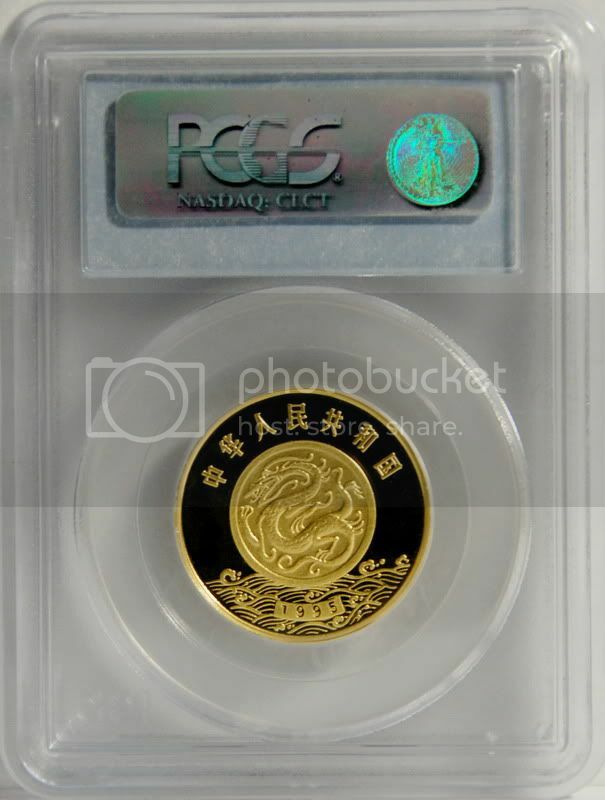 I'm a chinese gold coins collector and would like to share some of my personal collection with all of you. This is a 1/2oz. 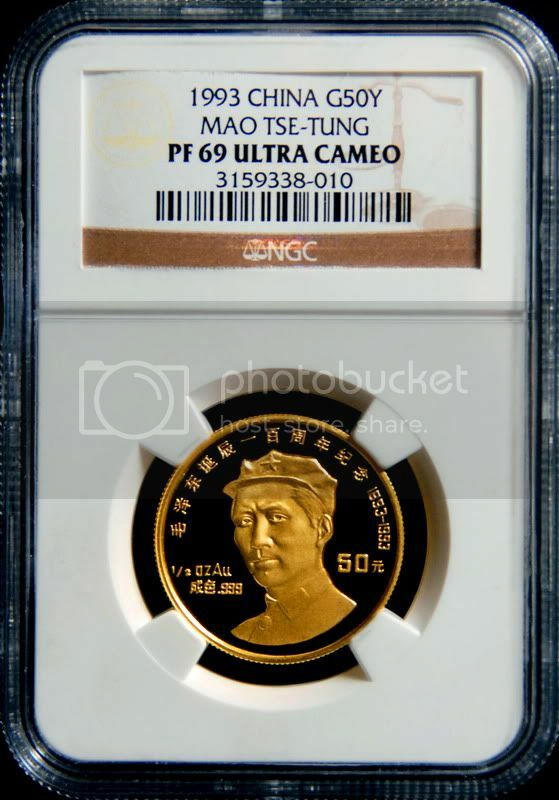 999.9 gold from the famous 1995 Yellow River Culture series with mintage of 2500 only. Very nice coin Andrew. Andrew is a very nice man and a pleasure to do business with. I hope you all have the opportunity to get to know him. Gorgeous coin, Andrew. Thanks for sharing it. Welcome to our forum! That's one of the nicest coin photos I've seen in a while. Great job on the coin, and the photo. 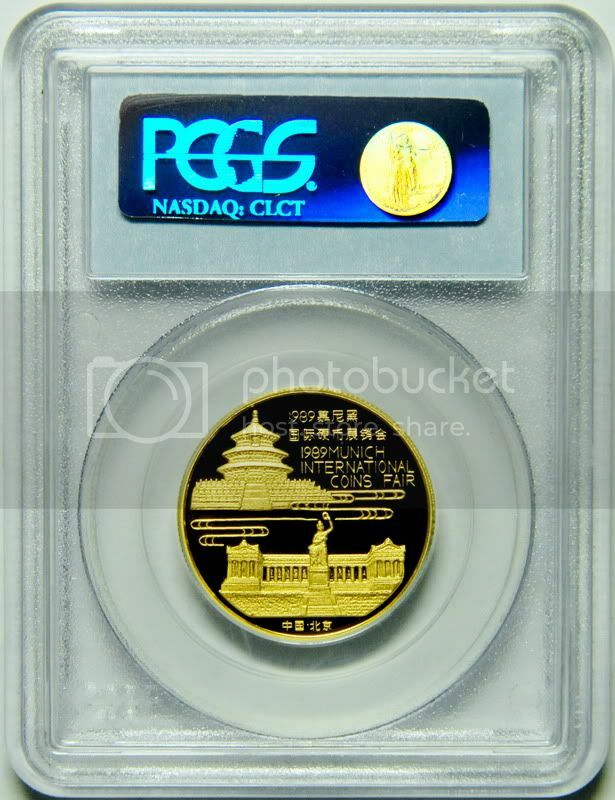 I haven't collected the Yellow River Culture coins, but seeing such a gorgeous photo does spark my interest. And follow by my Colorized golds collection in a show case. Hey DiggingNorway, I watch your videos. Chinese coins are my new addiction (it was silver before). $30 for those coins are a STEAL :) You can sell them for double on ebay if you wanted to. I am sure you won't. Enjoy them and keep up the good work with your vids. I actually added to the collection today. I have three 1997, so I lack two. The series was only made in 1995 and 1997, so 10 coins all together. 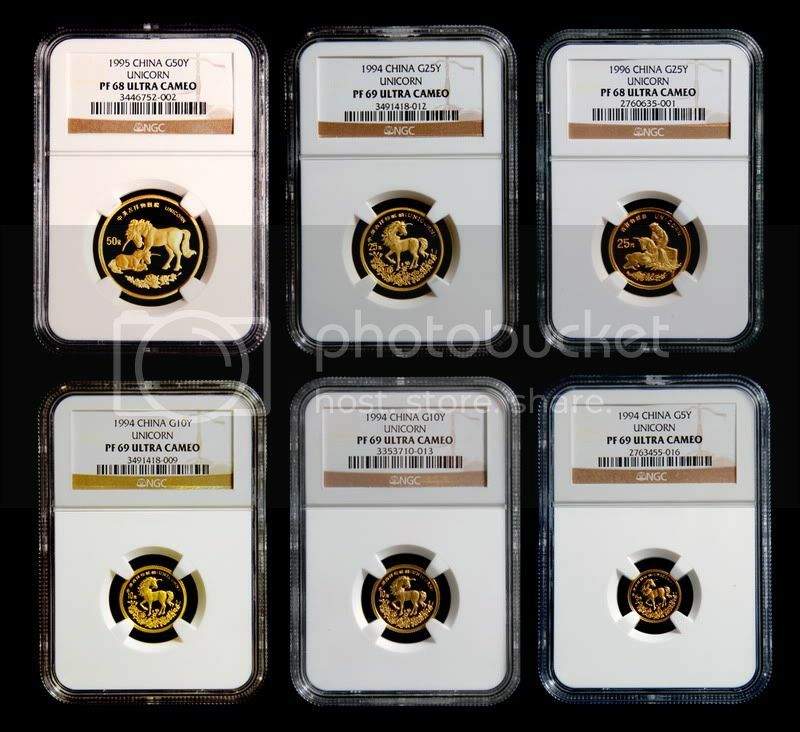 The historical figueres series is much bigger, 10 years with 4 coins each year. I did add s few today as well. I think you are "ahead" of the market right now. That is why you are getting them so cheap. Most Chinese coin buyers are probably so focused on the hot and popular chinese coins (pandas,dragons,horses,..etc). Those hot coins have a much wider appeal. As the market matures, people will start looking for other series to collect. I think the 1997 series has 35,000 mintage and the 1995 20,000 mintage. These are GREAT prices you are paying. BUT: ofcourse I am looking to sell in the chjinese market in 20 years or so, purely based on demographics, BUT: Noone knows the future preferences of the collectors market in China... I certainly do not. The stage is set for a huge collectors market in China in the long run... huge. After the population has covered their basic needs, they will start to collect painting, arts, stamps, coins, what ever.. but this is a "tertiary" demand, first we will have to see 200 million more being lifted up from industrial working class to middle class and uppermiddle class. Then its very simple mathematics. However, some of this effect is already priced in to coins.. I read some very very msart words here on the forum, I dont remeber who said it, but I belive it is crucial: The profit in numismatics is not done when you sell a coin, its done when you buy one. Thus: as I say in my videos (even though I am drunk in half of them) my strategy is to SAVE (i.e. postpone consumption) have liquidity and wait for the offers. (OK, the last increase did not follow that strategy, but I got some key dates with low mintage and my average is still good). In Norway, I can play the assymetric information game, not much interest in chinese coins here and dealers dont know their value. As a result some dealers price too low, some too high. Interesting; these are really good mintages. You should post more pics or make another video about them. In the US, you can still buy Chinese coins because the dealers don't understand them yet. The interest in Chinese coins made me more interested in the Chinese culture. That is a culture with a lot of depth and history. I don't drink;I am enjoying my healthy GREEn smoothie full of vegetables :O Enjoy your weekend. beer is a crucial part of European Culture and History (for at least 1000 years, not comparable to the US society)one last interesting point: at ny business school we have many chinese young aspiring students from affluent homes. One girl (which saw the coins) knew the history by heart (all the figueres on the coins; she could tell me the story and biography about the person on them) HOWEVER: she had never ever seen the coins before, she didnt even know they excisted! And this girl is an active equity-speculator! My bet is that affluent future chinese (with strong bounds to a country woth a history dating back thouands of years) will appriciate these rare coins in the future. That might have been me. I say "You make money when you buy, not when you sell", or something like that. I think its very good advice. the numismatic dealers have a huge spred between buy and sell, at the same time they have alot of capital locked into working capital... so I always bargain. Always. Well,post pics here then if you don't want to post them on youtube. I don't know if you realized this yet, but badon is THE authority on Chinese coins. I learned TONS from him in the past few days. my channel is a metal detecting channel, so this clip is "hidden", but I post it here to show the latest additions to the 5 yuan silver series.. I just finished watching it. Thanks for sharing all that info. I bookmarked those sites. 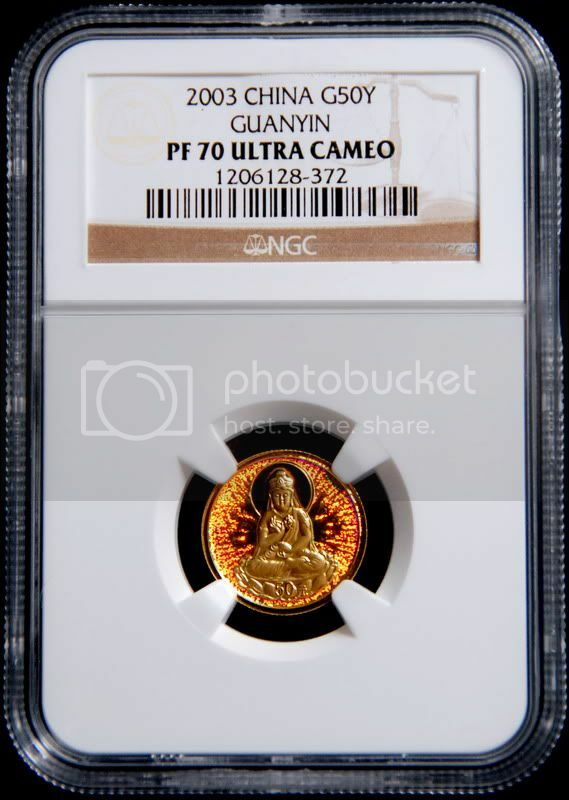 If you come across any sites that sell chinese coins (other than ebay), let me know. Don't worry so much whether people are interested or not in what you have to talk about. You are sharing your passions and people will watch. When you were showing your favorite Chinese coin websites, you started with this one, and I got so excited when you went looking for another one to show - I guess I was hoping my articles at LBC would make it into your video! Very enjoyable to watch your videos by the way. Sometimes I want a break from reading and replying, you know? I just bought a 5 yuan 1/20 oz gold panda 1998 for 90 USD from a coindealer in a city west of the capitol. I dont know if its a large or small date yet, I didnt want to ask, I just wanted them to send it ASAP while still holding my breath and hide my exicitment on the phone... They must have priced this one seriuosly wrong?? It looks like you are doing some "urban"/"telephone" treasure hunting :) Are they mint sealed? It doesent seem like many of the coin shops are participating in the panda marked or giving it alot of attention, many times they buy them for gold/silver spot + whatever margin the seller can argue for and the dealer belive he can push forward, and sell them with their normal margin to move coins fast. Nice coin, and so rare. You take excellent photos, thanks for showing me this beautiful coin. 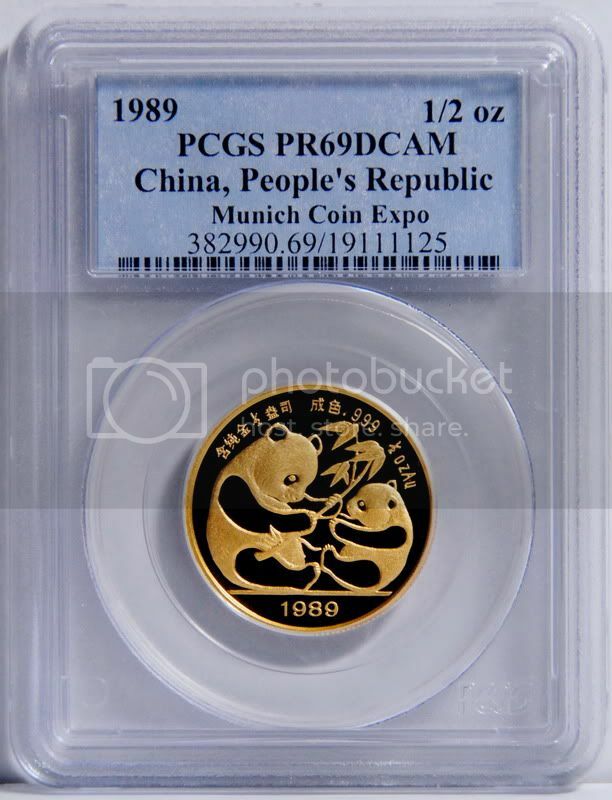 Munich expo coins are popular, and getting more expensive very quickly. It's nice if you could provide some information about the coin. I'll know more about the grade when it gets through the NCS/NGC process. It looks like a nice coin. Good luck. but I wonder... did they really come in the soft(?) PVC cover, with no hardcapsule inside?? I mean, this offer very little protection for the coins no? I have seen pictures of gold pandas that are in a hard round cover, and the soft PVC covering them? He has 1985, 1987 and 1989 on offer for aprox 10% over spot .... but I am afraid they are damaged... on the other hand.. if they were sent in for grading and get agood grade... woulden 10% over spot be a very good price to buy them for?? he receives them fra a bullion distributor from the US.... what do you think? like tha photo Panda Halves just posted ABOVE, it seems like it has both the hard plastic round, and the PVC.... whats the story here? I think the proofs come in a capsule and the non proofs in soft vinyl pouch. I bought many pandas in the vinyl pouches. This is a 1987-S 1 Oz Gold Panda. Those often have copper spots. Does he have an image of the other side? here is one of the others I got today... I have no idea what it is... 1997, 1/2 ozt?? Hot Kuanyin sitting in fire. Cool happy kid with a big fish. Wow! You do not know what coins you're buying ? What is the area of your strength ? I'msorry I dont understand your question. I pay spotprice for the coins (metal-price) si when I see a chinese coin with a kid and fish from 1997 which looks nice I but it. Is that a strength? I was asking about the strength of your collection or what do you collect the most ? For example, some people may specialised in collecting Pandas only and some may collect lunar coins. 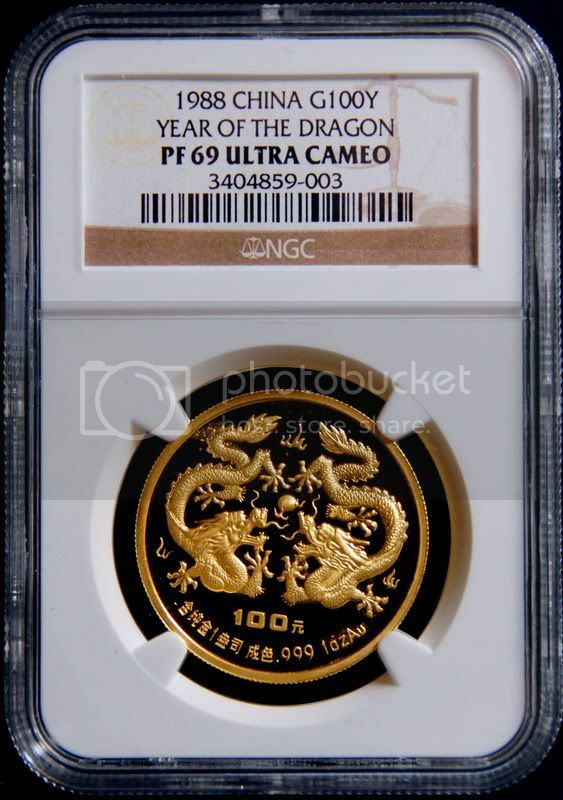 Hello, Now i would like to share one of the most beautiful dragon coin in my collection. Now I collect pandas, gold and silver, and modern silver coins... I have almost completed the 1995 and 1997 traditional culture series. I only miss one coin. I have about half of the historical figueres series, I have some of the unearthed artifacts, some olympic series..
basically I buy up all the modern chinese coins with low mintage I can get my hands on (when I get good offers) and my next step is to send them in to NCS/NGC as these are "European Coins" and they are "bashed by badon" It will be exciting to see what grade they will get.. I am kind of hoping that these silver coins from the 80s and 90s will become popular again and due to their low mintage they will becom interesting collectables.. in addition they are very beautiful coins.. Not many people collect chinese coins in Norway so one can get some bargains out there.. but some of the coins are probably not handled properly... so the grading will be exciting..
Just picked up this one with a couple others. Paid 150 for it. There are the milk spots that can be seen. The marks are on the capsule. I see no point in spending money on impaired examples of coins that can be found and bought in original condition. I make exceptions for coins that are truly rare or have study value. Thank you for taking the time to respond Peter! That does sound like great advice. I will be sending it back. Here are the ones to keep. Not the most expensive coins, but I really like the theme. Such a beautiful gold coin you have. This one is another of my favourite. wow, beautiful pictures, Andrew. Do you care how you take such good photos? What kind of camera? Any tips. Thanks. Wow! That must be a tough coin to find in investment grade! Nice! I use a Nikon D700 digital SLR to take the picture without its flash. The light come from my table lamp and not to shine directly to the coin as it could cause reflection, snap the picture from certain angle to ensure the reflection of the coin does not reflect back yourself. And you must have a steady hand when taking pictures in low lights. Your coin from the "Auspicious Matters" series is one of 11, silver and gold coins from the 1997 issue. In 1998 there were 5 coins in the series and in 1999 there were 3 coins in the series. I also like this series but think that it was not very popular, western collectors don't appreciate the symbolism. Hello, Here i'm again with another rare coin. 1988 A.N.A CONVENTION CINCINNATI 1oz. 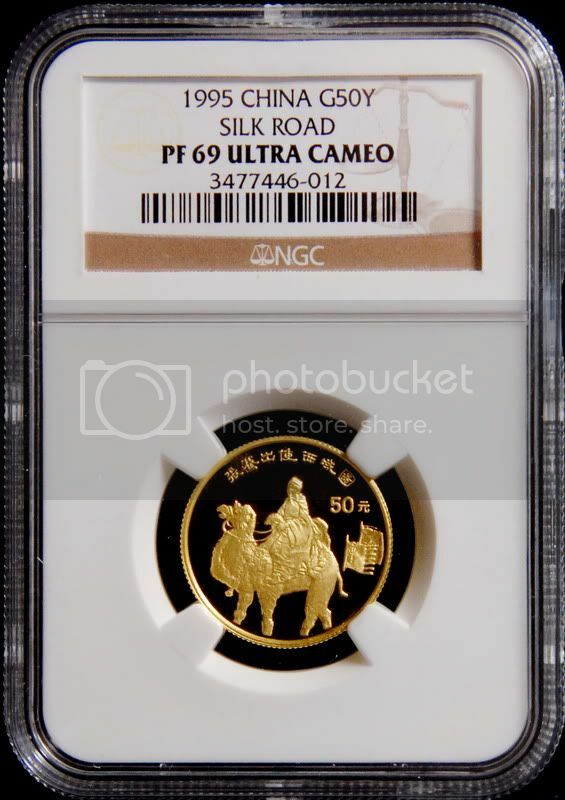 This coin 1995 Silk Road is not rare but it is hard to find in investment grade. look at the beautiful details on that camel. Thank you for such nice pictures, Andrew. Yes, Andrew's photos are some of the best that get posted on this forum. I really enjoy seeing them. The 1994 proof is back from grading. WOW ! Congratulation Pandahalves to get a Perfect grade. What a stunner! Congratulations on your magnificent collection, I am quite impressed. It is fantastic coin and getting the world's only MS-70 is a delightful result, the more so given that there were some worrisome plastic chips inside the original capsules. I was privileged to see the coin at the ANA Show. It's an extraordinary coin that belongs to a great, knowledgeable collector who is also a very nice guy. And now, a wealthier guy too :) Those 70 coins just make me drool dollar bills. I can't believe the sums of money I have spent on 70 coins, but in hindsight, they were dirt cheap. My favoriest is the Kanfu panda set. By the way, does anyone have any clue on the current market price the attached 1982 football coins? Such a beauty of gold kunfu panda you have here. Yes, the gold one is nice, but I think the silver one is rarer, isn't it? wow why would anyone be tired of viewing your coins andrew? Keep them coming. beautiful coin ! Thanks for sharing. Yeah, these are some very nice coins, and very nice photos. Thanks for posting them, and keep them coming. I love looking at them. Just keep posting your coins. They are all perfect in the slapped holders. Just wanted to share with you some of my Unicorns collection of various years. Why do you have 2 1994 1/10 oz gold unicorns? Is one for sale?
? "Why do you have TWO 1994 1/10 gold Unicorns?". If it were me, the answer would be " 'Cuz I haven't found my THIRD yet!" Yes, it is a 1996 Small Date. Nice coins Grip! Some of my favorites as well. I especially like the 96 Panda, it can't really be called a sleeper, but I think they are undervalued for sure, and they will only get more popular as the 98s and 95s get scarcer. Any ideas on relative scarcity of 96 large dates vs small dates? I believe the Small Date 1996 is more rare. Can anyone confirm this? NGC population is rarer between the large and small date specific grades, but a lot of 96's were graded with a generic 1996 MS. I'm sending the coin back with my next batch of raw coins for regrade as the slab has a small ding as well as the wrong date type designation. Just got these back from NGC. All conserved before grading. Nice grades, almost all of them are 69's. Congrats to you Grip for having such beautiful and high grade coins. You must be very proud owner. 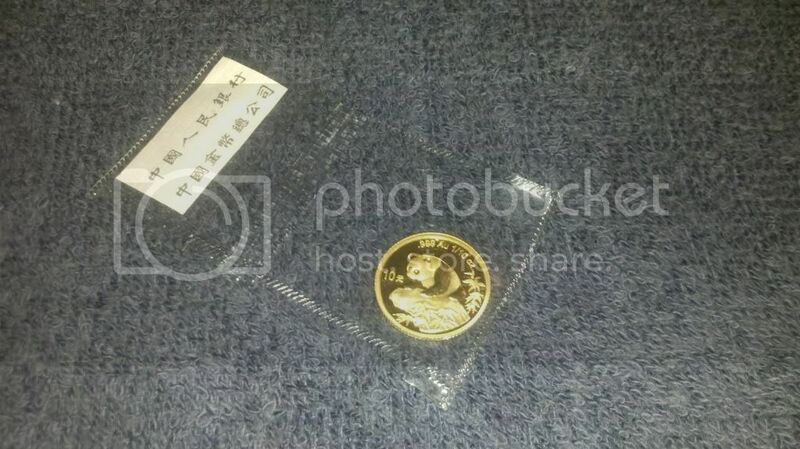 The photo is from the Gold and Silver Panda Coin Buyer's Guide. Such a rare item there was once Panda America were selling a similar one. Yes, they had one that turned up in their vault a couple of months ago and mistakenly put it on eBay as the gold medal but then pulled it off. They didn't know what it was. I called the store to see what happened to it but couldn't get an answer. It's definitely not worth as much as much as the gold medal right now, but as the apparently rarer of the two medals there's no telling how it might be valued in the future. It's an intriguing and mysterious medal. Perhaps someone reading this Forum has some first-hand knowledge of its history. Nice coin. I would guess that the actual Mintage was nowhere near that. Another buy today. Sorry for the bad quality of the pic, but it's difficult to capture all 4 coins. Don't worry, fingerprints are only on the capsules. Such a beauty, congrats ! What theme do you collect care to share ? Hey Guys, Here's a few nice coins I recently got back from a batch sent to NCS/NGC. The 83 and 84 Brass Pandas were bought off an ad online 2 or 3 months back for $14.00 (Double Sealed) for the pair yes fourteen US$$$DOLLARS!!. I was skeptical at first but for $14 I took my chances, I still can't believe how little value the original owner had for them. Worked out great for me, for now I would consider them the rarest in my collection as far as PFUC69 availability on the bay goes. And the 1999 5Y LD Serif 1 I bought back in January for a couple hundred on eBay off a bad photo and coin already out of OMP, I haven't seen one sold individually in over two months. Over all my coins came back great all 69's including 1987 PFUC 1&5oz silver, 1999 silver Beijing Expo and some other goodies in fact the lowest grade was the 1999 5Y Serif ms68. Now I just need to figure out how to get the rest of my coins graded without selling, I guess I can't quite my day job yet. Wow, that brass panda came back from NCS looking spectacular! I believe the 84 had a few copper spots and they cleaned her right up. They looked good in the OMP but NCS did a fantastic job conserving them. here a nice picture from my china coin collection. Very nice! I love that unicorn design. It's one of my favorites. A few highlights of my latest batch of raw coins sent to NCS/NGC. Turnaround time was about a month. The coins should be arriving any day now. Interestingly, I sent a batch of mostly older coins directly to NGC at the same time (6/24) (bypassing NCS). That batch is still "scheduled for grading." This is the highest concentration of high grades and rare coins in a single batch that I have seen! Congrats Birdman!! These words are "星星之火可以燎原----毛泽东"。 This is a very famous saying by Chairman Mao Zedong. It means " A single spark can start a prairie fire. " 上海造币厂铸造 means the medal was made by Shanghai mint. Did you buy them graded or did you send them off to NCS and NGC yourself? I sent them to NCS/NGC myself. I already had the same year's 40th anniversary of aviation set and I thought rounding out the set for a low price would be a worthwhile endeavor. In my opinion the 1996 airplane coins are a better investment, especially the Jet Airplane which will probably be the key to this mini-set due to popularity. However, from a collector's standpoint I would rather own all four coins instead. Yes those small stickers are actual price paid. I also found a 1984 Year of Rat PF Silver coin in original box with COA in perfect condition at a random coin store for $250.00 and sold it to a fellow forum member at cost because I don't collect those things. didnt bother putting a picture up due to the availablity of my new purchase. anyways, just bought 8 sheets of 10 1989 bu silver pandas. super fresh. hiphip hooray!! Oh no, you don't get off that easy! Pictures are required! Front and back too. You might have some interesting varieties in there. Here is a recently graded Invention & Discovery Coin from 1995. It depicts the invention of the Cannon & Gunpowder. There are only three graded by NGC with this being the highest graded by NGC. This is a legal tender 50 yuan gold coin. These coins from the Invention & Discovery series are still extemely undervalued in my opinion. 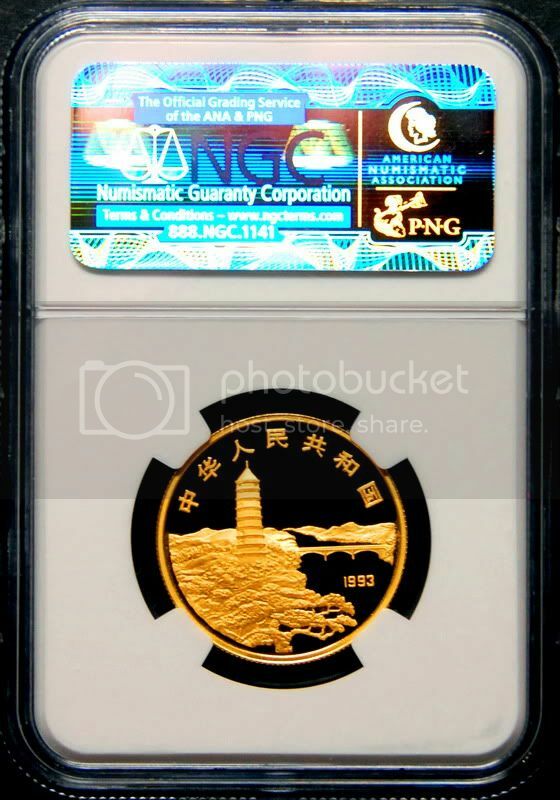 Check the NGC population figures and compare to any of the "popular" coins, 1995 Panda Proof, Fu Lu Shu, Peacock, or Unicorn. None of those come close in rarity yet the price of these coins is significantly below the coins mentioned. Is that one for sale? 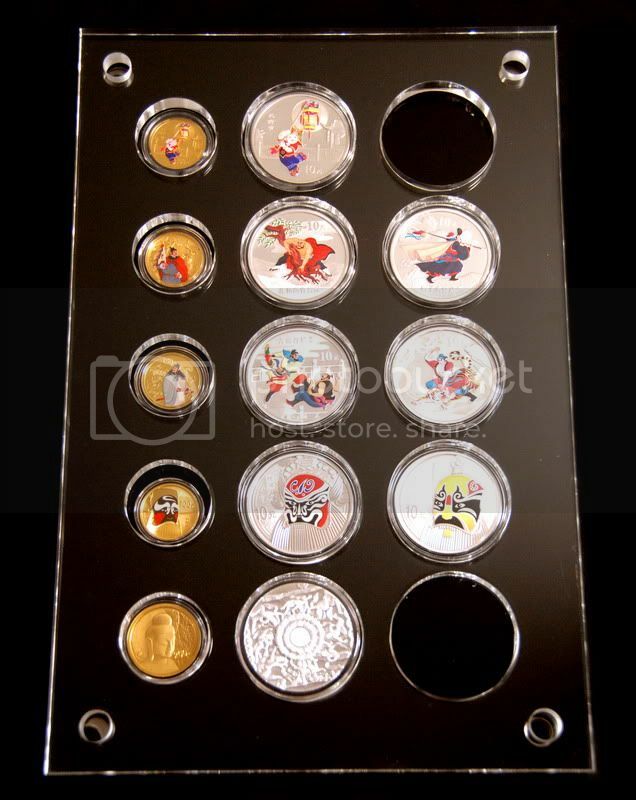 Such a "perfect" and beautiful coin you have there, did you manage to assemble the full set of 1995 I&D ? 1979 GOLD CHINA 400 YUAN 4 COIN PROOFSET 30 ANNIVERSARY - IN CELEBRATION OF THE 30tH ANNIVERSARY OF THE FOUNDING OF THE PEOPLE'S REPUBLIC OF CHINA. This is the set that started it all for the Modern Chinese coin era. Extremely difficult to find in this condition and fully complete. The coins were not double sealed by the mint. In original wooden box with gift wrap box and COA. The design on top of the box is all wood 3D elevated with very accurate details. The pictures does not capture that. I removed the COA number for security reasons. Best quality presentation box I have ever seen. I have a full set of 1995 I&D plus some extra singles. All my coins are for sale. I also have a 1993 set, and a 1994 set. There is presently on Ebay a nice 1993 set for sale. Yes I saw, but for $27k+ they can keep it. I paid my 1979 set double the price of gold spot. With rare coins the content of the metal becomes irrelevant. I can think of many examples. There are copper coins that sell for hundreds of thousands of dollars. The 1997 10 yuan platinum panda is a $ 20,000.00 coin. The price of the 1993 I&D set is about right. It's a very clean set, too bad one capsule is cracked. There is a set being auctioned in Germany next month and we will see the pricing. I sold a 1993 set recently, no box, no coa's but all graded NGC PF69UC for $ 26,000.00. Yes I agree. It's just a better feeling getting them as close to spot as possible. I just cant afford them! I'm sure that's a great rule in a organized, rising market, like in the inflationary periods we've seen. But in a deflationary time, it's prudent to have a mix with no premium ie bullion, because the high end high premium stuff might have no buyers, and be hard to liquidate, hence the premium diminishes, hence loss of money. I'll defer though to the longer term guys who lived through the 2007- 2008 asset drop, as to what they saw. It's all about where you are in the cycle, that determines what is a good investment. Yep, that's good advice. If you buy bullion, you want the cheapest bullion available, with no premium at all if possible. I know these pictures are horrible but I took them with my Iphone. I looked at the coins under magnification and they appeared in excellent shape. They are nothing exotic but it is gold and they are pandas so I’m happy. WOW taciturn that is a phenomenal bimetal panda set ... I want one like that !!! Great score man !!! These are totally awesome! Great Job!! I hope the early dates get a 68/69. Most of these were mishandled and the higher grades are tough to find. wow buynicething that coin is phenomenal ... congrats on the 70 !!! I don't know much about those coins but from what I do know I believe this one is very rare and highly valuable isn't it? What would this coin auction off at? Oh yea I see you've had it NCS conserved as well ... very nice ! good on you man for such a nice collectible ! I love the design of your coin and it looks really nice! Congratulations on getting the 70. Here they are, 1995 Kwan Yin 1/2 ounce silver set with mintage of 3,000 in OMP and 1995 Mazu 1/2 ounce silver coin with mintage of 8000 all double sealed with COA. Most of these were mishandled and the higher grades are tough to find. yes grip you have a valid point here and that is a concern for me. My last gold panda (new orleans 1987) graded at 69 so I am optimistic and these coins did look pretty good although the pics were horribe, the plastic on the older coins affected the pics too. Well I may know by tomorrow as I expedited them (I'm impatient) and called today, they were printing the labels so hopefully quality control/finalized/imaged/shipped tomorrow ! I'm a strong beleiver in NCS/NGC however in my opinion coins such as this should be left as they are. Your gold Pandas are magnificent, I still have all of mine in OMP. I also just received the 2001D 1 ounce. Very nice 2001-D !!! I still need to get this one. 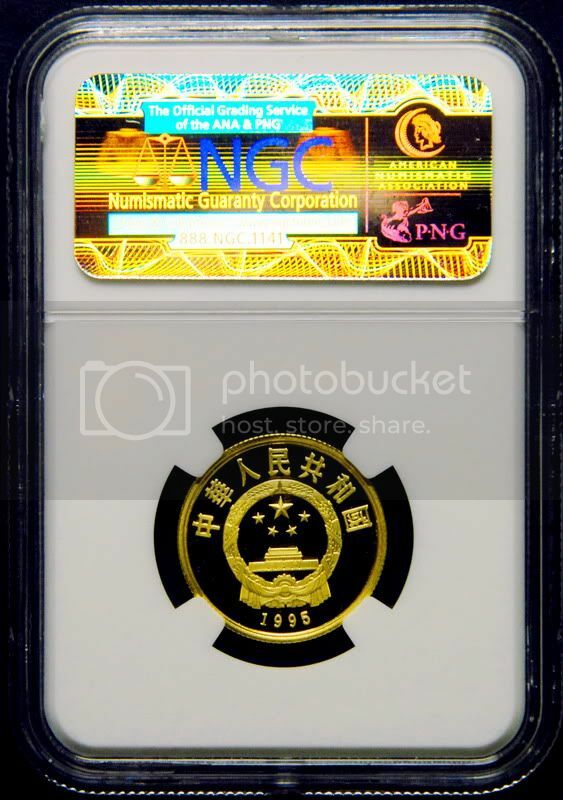 I am just starting to begin sending in some of my 1 oz gold pandas to NGC and will be getting more out of the bank next week to send in as well. Yea I know there has been alot of discussion about graded verses OMP and i think both sides have valid reasons to support their views, I think it's just a matter of preference. Although I do have the majority of my S10Y pandas graded, I still have many in OMP and will never grade such as my 5oz's, commemoratives & 2007 Anniversary set. I buy and have bought nearly every one of my pandas in OMP before having them graded and have done well but many still remain in OMP and will always be in that state. There are situations such as am MS69 2000 Mirror or MS69 1995 Micro that I felt better buying NGC graded. In any case, all of these coins you have uploaded I am 100% behind you that I would not graded them as well. They are beautiful, rare & just as valuable as they sit right now. That is just my opinion. Very good points. Do you keep the OMP? When you sell your graded coins one day, you can include their OMP and grade receipts so it proves to the buyer you were the original owner prior to them been graded. That could increase the confidence of the buyer knowing who the original owner was before it was removed from the pouch. I totally agree with this. Even if I buy graded coins, I would like the OMP to be included. Do you keep the OMP? I must have swallowed some dumb pills which hindered logical thinking so no I did not keep the OMP but really wish I would have for all the reasons you have stated, not to mention it would have made it possible to identify the various mints on certain coins. This was a newbie mistake on my part. From this point forward I will be keeping the OMP on all of my coins before grading. On a side note I’m curious why gold pandas are not double sealed? Since gold is much softer than silver this only would seem sensible. I’m hoping that future mintages of gold pandas are double sealed and that the silver coins would revert back to double seal packaging. Nice set of Kuwan Yin's "exchange"...I like them in the OMP's. I guess this 1983 grading at MS69 further substantiates that gold coins left in their OMP for 30 years can remain in mint condition. I was bummed about the 1982 as being “tooled” as it was also in OMP and I have always gotten very good NGC grades from my APMEX pandas which made this particular one anomalous. 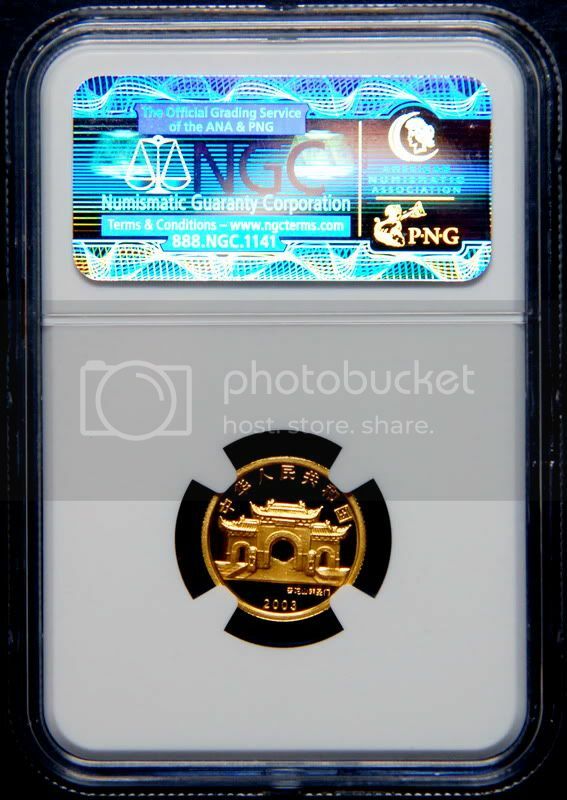 Good news is I sent this NGC order to APMEX and they amiably agreed to issue me a credit or exchange plus pay shipping and grading cost so no buzzkill for me ! "I was bummed about the 1982 as being “tooled” as it was also in OMP ..."
In looking more closely, it appears maybe the mint pouch was resealed..?.. My favorite Chinese coin series -- Bronze age finds / Unearthed Artifacts. This is a 1992 set. 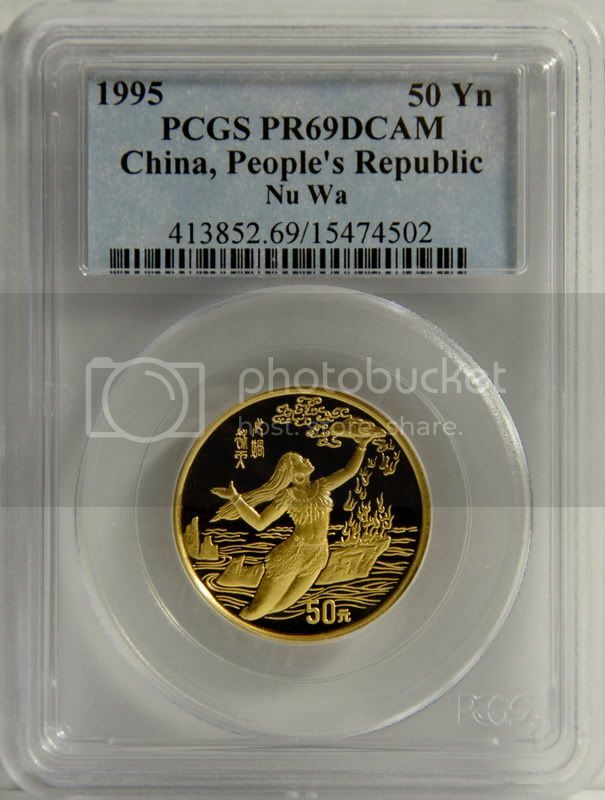 Fyi, this series is one of a very few Chinese coin series THAT DO NOT have nation's (People's Republic of China) name on either side.. This is actually quite weird, or even possibly a design error, they have face values because they are legal tenders. Few other examples are some 1980 lunar coins and some early sports theme sets. Anyway they are really beautiful. Congrats! Gorgeous coins! They are hard to find in 69. Any idea how i can get my hands on the Resting Deer & the Lantern one. Congratulations Catfury! These are good looking coins. I'm always interested to see the rare and beautiful coins that members of this forum have on their collection. I know everyone has noticed the huge delay when submitting "World Modern" to NGC which is now about 30 to 40 working days but I have noticed that when submitting through NCS my orders like that have processed much faster. For example one of the orders I am waiting on was submitted to NCS on 8-9-11 and I checked online today, it's already in quality control today ! Here is the 1987 that I got from Panda America last month for $1,708 and it also graded PF69 ... I really like this coin. Just got my first Munich. I am wondering though if this is the original seal. The seal looks like its from the Shenyeng mint. Do you have the COA because that is key. Usually on the COA it is indicated where the coin was minted. also wanted to add..... the plastic pouch appears to be from the Shenyeng mint, if on the COA it also confirms that, chances are it is an original seal. I had a great morning at a local coin shop ! These are my 1994 Small Date Gold Panda and a 2000 Frosted Gold Panda in OMP. These pandas will be sent to NCS and NGC for conservation and grading this Monday. Wish me luck on the grading. They will be my first gold pandas to be submitted for grading. Being a rookie on CCF, NGC recommends that you place each coin in a non-pvc coin flip prior to shipment. I usually follow their recommendations. Does any CCF members send your Chinese Pandas in their OMP during shipment? I was thinking about doing this as a another means of verifying authenticity of the coin. For double sealed coins such as your 2000 I never break them from their double seal. In fact, I typically request that the capsule be returned to me. Chinese modern coins have the advantage of already being in a plastic pouch. 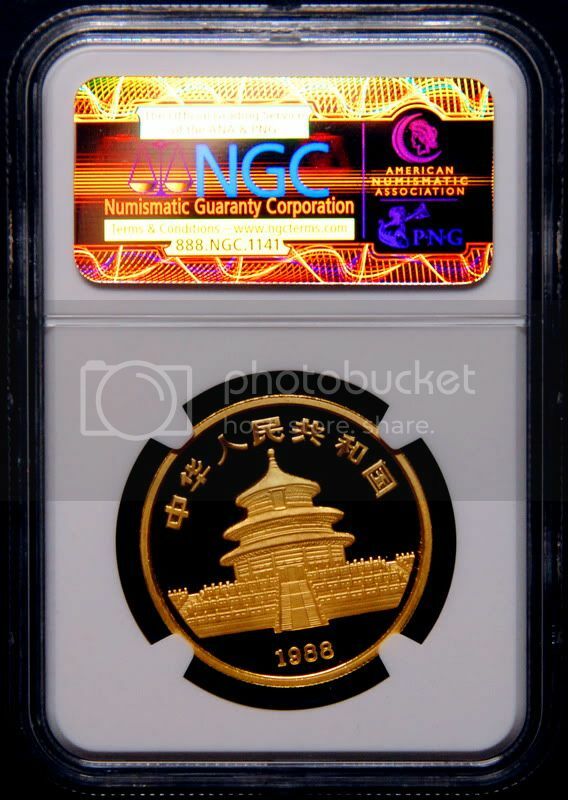 Not all coins come this way so NGC/NCS prefers that they be sent with this method of protection. This is probably a general rule to avoid receiving something like a sock full of old randomized coins they have to dump out on a bench. You have to think in terms of the average coin submitted and Chinese coins are typically above average. I know some people that put them into the recommended non-PVC flips but I simply leave mine in the original plastic. They have been this way for years and the likelihood of them getting damaged further by removing them yourself is probably greater than if you just left them where they were. That being said, I actually believe original sealed coins do not offer sufficient protection from sliding around and getting damaged so I have developed my own personal way to double seal and protect them during shipment. What I do is buy Coin World plastic holders (that typically come with some random sized insert). Then I take the insert out and put my coin inside with it in the original plastic. I fold the flap of the original mint packaging over the coin to offer a bit more padding and to ensure that it doesn’t slide around. I then take all the coin world holders which actually stack very nicely and sandwich them together with a rubber band adding double seal coins on the end then I send them in this way. I’m sure people have other probably less complicated methods but this seems to work for me so I thought I’d share with the community. Coin World holders can be had for $2-$3 and they seem like a good investment. You will not get them back though so it adds a modest fee to your bottom line. I have never had the privilege…. Er… I mean inkling to send in 1 ounce coins but I’d imagine this process would work there too. Hello Panda Express … very nice Gold Pandas you have here ! The gold pandas up above in my post were sent to NCS where I did just as Panda Halves instructed you and all was fine. 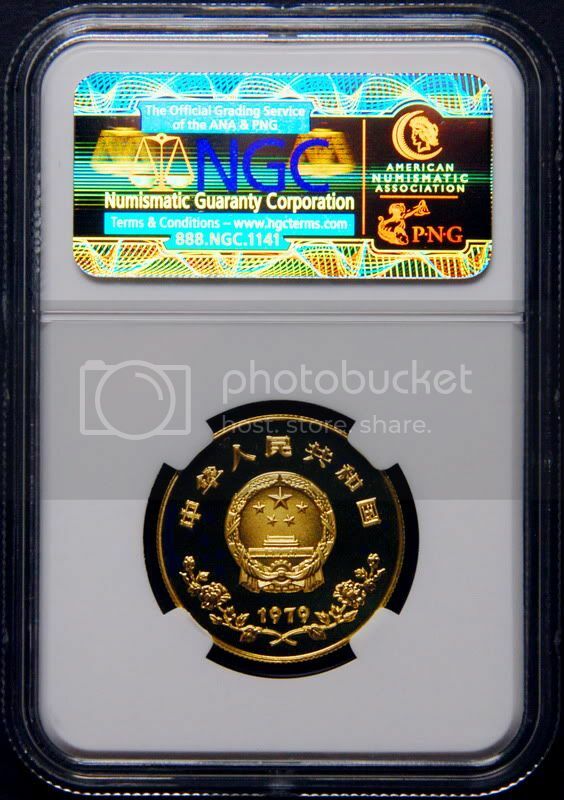 I submit my gold pandas to NCS/NGC exactly as Panda Halves has conveyed for the exact same reasons, on the NCS form below each coin entry I type in “Please conserve NCS then grade/encapsulate NGC. Please return all original mint packaging”. 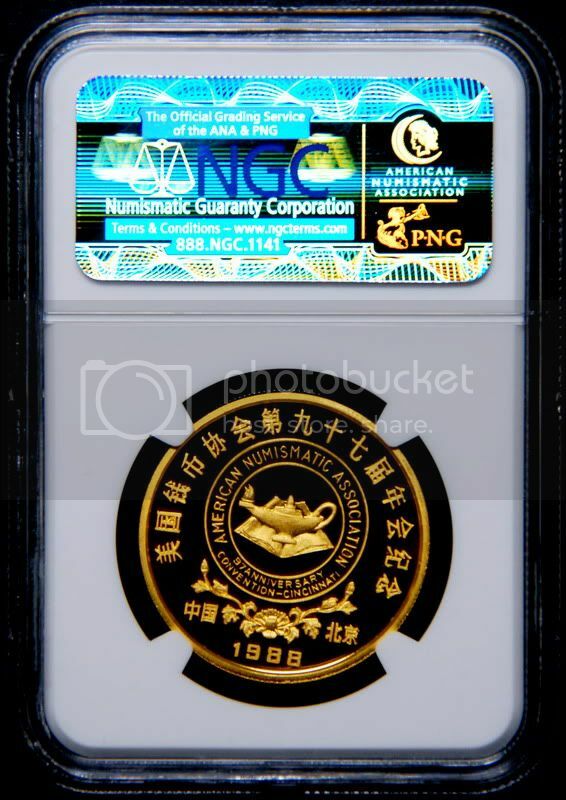 For some reason I have found when I submit directly to NGC, I don’t always get the mint packaging back but when submitted to NCS before NGC … I always get it back so I don’t know why but that has been my experience. Good luck on your submission !!! Gorgeous coins, especially the double sealed 2000. Considering only two years (2000 and 1999) where the gold pandas were double sealed, it really is a shame to send them out. PH, I certainly learn something new every time I view this forum especially coming from CCF members whom I routinely follow. I will certainly keep these gold pandas in their original pouches as recommended by you during shipment. I will also request for the OMP. Thanks for your advise. On another side note, I see you have a beautiful rare 1994 half oz. panda as your coin logo. Your coin has a very limited mintage of 16,788 with only 2000 coins in BU condition. In the not to distant future, I would like to complete a 1994 small date collection. Exchange, most of my panda collections are in slabbed NGC coin holders which I prefer over OMP. I had second thoughts on sending my 2000 frosted panda for grading for the same reason you just stated. From an investment perspective since I am holding my collection for at least 5-10 years, would certified graded coins have an advantage over OMP? I would definitely like to hear your thoughts concerning this matter. Hello Comeaux! Thanks for those encouraging words. I will definitely be needing it during my upcoming NGC grading. I also want to congratulate you for your high scores on your gorgeous looking 1 oz gold pandas. Incidentally, you are 2 years ahead of me, and I am holding on to my collection for all the same reasons when your first introduce yourself to the forum. I see you have a beautiful rare 1994 half oz. panda as your coin logo. Your coin has a very limited mintage of 16,788 with only 2000 coins in BU condition. In the not to distant future, I would like to complete a 1994 small date collection. Notice the small "P" to the left of the Panda's back? It is the proof version not BU. I am holding on to my collection for all the same reasons when you first introduce yourself to the forum. It’s great to see someone else collecting for the same reasons! My wife joking claims I am much too enthusiastic with this panda collection for it to be only for our son but honestly that is most of the excitement building this collection. Panda Collector stated “nothing like a new arrival in the family to give dad a sharper focus” and he is right on with that statement. Here are the pictures of gold pandas I submitted yesterday and as you can see they are exactly as Panda Halves did as well. This is two 1 oz & five .25 oz pandas and as you can see they are not exciting dates but hey they are gold pandas ... much better than any American Eagle or Canadian Maple ! How did you get in touch with the Director of Numismatics? It would be great if one can buy a coin and the seller will say that he or she will choose the best coin if there are multiple coins available. Apparently my email to apmex returns department expressing dissatisfaction was forwarded to him and then he responded to me. The fact that my membership there is now “gold member” may have had some influence but I’m not sure. All I know is that he did as promised … I just received my replacement 1982 panda in OMP today and from what I can tell under magnification he did an excellent job picking one for me. I’ll be sending it to NCS/NGC on Monday so I will soon find out what it grades. Here are the pictures which are not that great because of the plastic but the coin looks phenomenal. I hold bullion and then I hold Pandas. Pandas to me is something I will sell last if at all. It is surely an investment just like my bullion, but unlike my bullion it has significant numismatic value even though Pandas were originally meant as bullion. It is because they were meant as bullion with low mintages they are so much sought after. 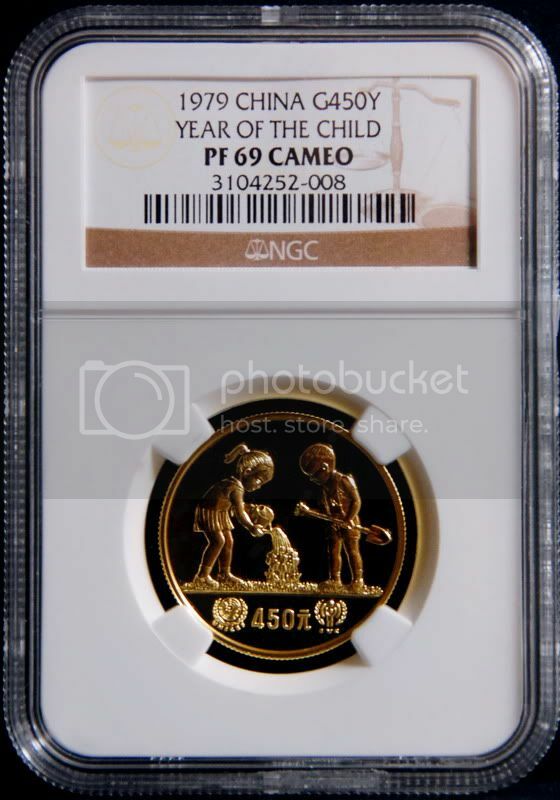 Most in this forum will grade any coin that comes across their hands because of the conservation theory and what "supposely" NGC does to protect coins long term. Many articles on that subject have been written and both sides have valid points. When a coin comes in a plastic pouch and all coins from the series have the same OMP I guess grading them isn't a big deal, but when out of all those years, only two of them come in a different OMP such as double sealed then I believe paying for plastic will come into play........ (resealing is another issue). Before I sell any of my Pandas, I will sell every other coin I have. The gold pandas I hope to leave to my children one day. I am very fortunate to have started buying Pandas in 2008 and premiums for them back them were non existent. Spectacular coins. One regret I have when I started buying Pandas in 2008, I only concentrated on the 1 ounces, I never bothered looking at the fractionals. I was paying something like $30 to $40 over spot for most of the Pandas I got. Back then I just did not want to pay the higher premiums for the fractionals compare to the 1 ounces.......... oh well at least I have all the one ounces. Hello Exchange, I certainly share the same sentiments on owning bullion and numismatic gold panda coins. During the early part of 2008, I too began to invest in gold and silver bullion mostly gold eagles, buffalo, and Canadian maple leafs strictly as a means of preservation of wealth and investment. I also bought pre-1933 British sovereigns as another means of asset protection from the remote possibility that the US government may nationalize gold. From a historical perspective dating back from the Great Depression, holders of numismatic gold coins were protected from Executive Order No. 6102. My only mistake was not investing in modern Chinese numismatic coins at the time. I only started collecting and investing in Chinese gold and silver coins during the early part of this year. I just hope the prices of panda bullion and proofs do not sky rocket to fast to the point that it will be out of reach for most collectors and investors alike. Due to limited mintages of panda coins and the gaining popularity of these beautiful rarities, I soon began to realize that these coins were far outpacing my other investments which began my interest in these coins. 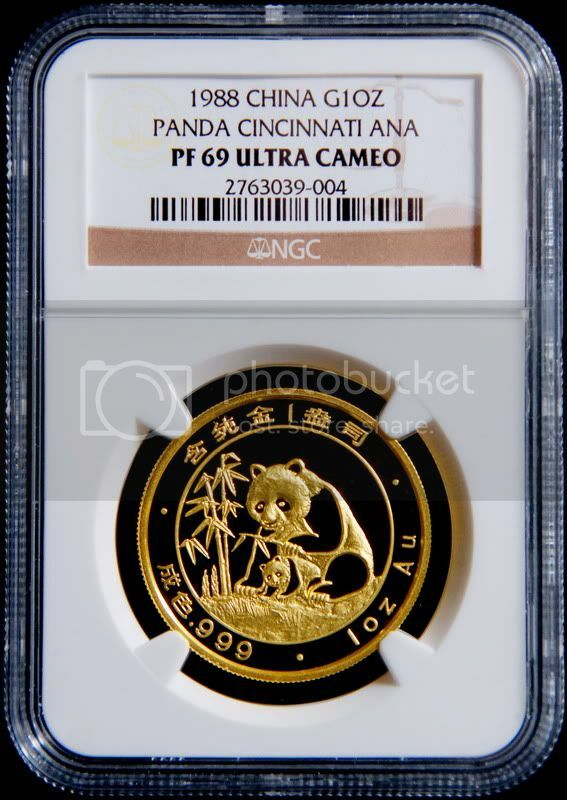 Additionally, considering modern gold panda bullion may be subject to the possible nationalization of gold, I have all my panda collections slabbed and certified by 3rd party grading companies preferably NGC to preserve its numismatic significance as compared to holding OMP Chinese panda coins. Wow Panda Halves! You really have a winning 1994 Panda half proof, a true gem. I totally overlooked that peculiarity of your coin. I may need to get my eyes checked out. lol. oh well at least I have all the one ounces. Yea that's a bummer when all you have is multiple one ounce gold pandas !!! I'm just kidding you but no really that's really totally awesome to have all of the one ounce gold pandas, very nice ! I'm kind of like you with the fractionals and predominately I buy the one ounce gold pandas but more and more lately I've been picking up the fractionals as well to complete my sets. I have a really nice order in route to me now and plan on getting more of the fractionals in the future. Panda Halves that is an extremly nice/rare panda you have in your collection bud ! Just picked up another 1/10 1999 Panda this morning.